It is becoming clear that the Mediterranean region is one of the "hottest" of the biodiversity hotspots on the planet. There is also an increasing concern for the conservation, adaptive management, and restoration of the unique natural ecosystems and cultural landscapes that characterize this area. The region's biological and cultural heritage as well as its huge wealth of biodiversity is now at real risk. 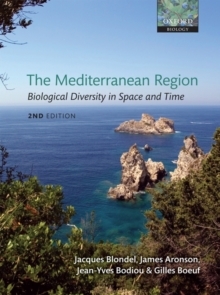 This brings a further urgency to the task of communicatingdetailed but readily accessible information on the Mediterranean biota, and an ecological, historical and evolutionary perspective to the changing contexts in which the region's flora and fauna continue to evolve. There is no other recent textbook devoted solely to Mediterranean evolutionary ecology, and a synthesis of the many recent advances is now overdue. This new work builds on the success and reputation of the first edition, although the text has been updated and expanded to document recent changes to biodiversity, new ecological and evolutionary insights, and the challenges for the future. These changes include the addition of two new chapters devoted to the Mediterranean Sea itself, andespecially the coastal areas. Throughout the book, the pressing issues of global change (especially climate warming) are addressed, in conjunction with changing land use, and in terms of their potential impact on biota, communities, ecosystems, and landscapes.